Vintage Leaf Memories - Michael Langlois: Will the real Maple Leafs please stand up? Will the real Maple Leafs please stand up? Those VLM readers who are of a, shall we say...slightly older vintage, may recall a television show from the 1950s and ‘60s. I’m trying to remember the name of the program, but as I recall, the celebrity panel had to try and guess which of the three contestants was actually the person they claimed to be. At the end of the segment, the moderator would say, “Would the real (name) stand up, please”. That’s kind of how I feel about the Maple Leafs, at this juncture of the still young National Hockey League season. Who are the “real” Maple Leafs? After a neat little streak (four wins in a row, I think it was), there were many positives to talk about, including a more effective “system” of play. I’m sure most Leaf supporters were hoping the weekend would see us move a little further up the Eastern Conference standings, especially with the young and struggling Sabres on the agenda Saturday night. In fact, however, the Leafs lost ground, losing a close one to the visiting Penguins at the ACC on Friday night, and gifting the hometown Sabres a win in Buffalo on Saturday night. Friday against Pittsburgh, Jonathan Bernier certainly gave the Leafs a chance to win. I’m not sure we could say the same for James Reimer on Saturday. It felt like it was the first game this season that Reimer didn’t at least keep Toronto in a game. Last season, he, like this year, had some excellent outings early on but also a couple where Carlyle pulled him after a faulty start to the game. He wasn’t pulled against the Sabres but it may well have crossed Carlyle’s mind—either because Reimer wasn’t at his best or simply to get the Leafs going in a city that has not been their friend. Buffalo has indeed been a lousy place for the Leafs to play over the years. This isn’t a recent phenomenon. I remember, going all the way back to Buffalo’s first season in the NHL in 1970-‘71, that we weren't good against Buffalo even then. In fact, I seem to recall that we got waxed by Gilbert Perreault (still one of the most exciting players I have ever seen; what a talent) and the expansion Sabres during their first season right at Maple Leaf Gardens by a score of something like 7-2. 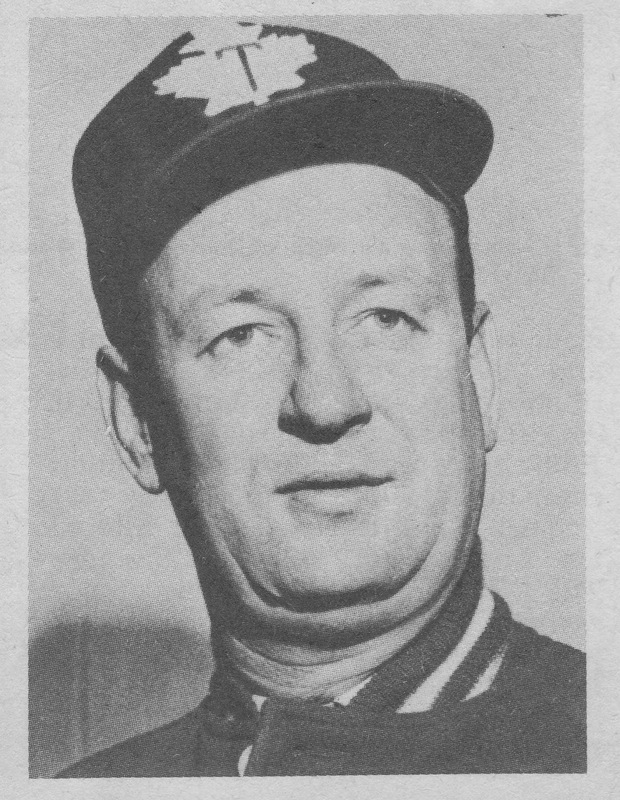 Former Toronto General Manager and coach Punch Imlach (right) was in charge of the expansion Sabres at the time and he was behind the Buffalo bench that night, if I’m not mistaken. It was a victory that would have warmed Punch’s heart. But even in relatively recent years, while the Leafs have won games here and there in Buffalo, it’s generally been a place where the Leafs come out flat—and stay sluggish—more often than not. That said, that’s no excuse for Saturday night, playing a Buffalo side that has not won many games so far this season. (The game against the Leafs was their fourth win in 19 games.) Yes, the Sabres have some talent, including young Girgensons, and are well coached, in my view. But that was a game the Leafs needed to win, to keep the positive vibes going in Leafworld. We knew Pittsburgh would come out and play well Friday, on the heels of their poor showing against the Rangers a few nights earlier. But Toronto's effort against Buffalo was not good enough. The Leafs are probably where many fans thought they’d be. They’ve had some good outings. Before the Pittsburgh game, the wind seemed to be at their back. And hey, a couple of losses will be forgotten if they can get back to their winning ways against a pretty strong Nashville team Tuesday night at the ACC. It’s a long season, after all. One of the reasons we often talk here at VLM about not making any major assessments before the 20 game mark is precisely because it’s best not to base opinions on a small sample size. This team can be infuriatingly bad, and conversely, it can make you feel as though they are not that far off from being a strong team. On any given night, we’re thrilled with our goaltending, and feel good about the play of any number of players. At those times, the top line is skating and burying their chances, Kadri is at his cagey best and the third and fourth lines look better than they did a year ago. Komarov and Holland have made contributions, solidifying that bottom-six, and those contributions need to continue as the season moves along. But I still have questions: are we strong enough up the middle? Will we get what we need from our second line? Will our third and fourth lines be effective over an 82-game season? Is our defense good enough to compete against really good teams? Again, on a good night, the Leafs show promise and we feel a sense of hope. But after an outing like the one against the Sabres, it’s hard not to feel rather, well, lukewarm. What’s your gut telling you? Is this team, as currently constituted, good enough to play with the best in the East? Do we have the leadership to compete? Most importantly, does this group have the ‘will’? Do they hate losing enough that they will do everything they can to win? We're not at the 20-game mark, but we're close. A good title, Michael! Was that "To Tell The Truth"? I think there was another one called "What's My Line?". Either continues to fit the Leafs. What is it about Buffalo anyway? I usually watch games to the bitter end but I gave up on this one. If you can't score at least hit something and get involved. I'm as "befuddled" as the team appeared to be. Did you notice all the lines but the 1st were changed , Michael? It was hard to tell who was playing with who. Sometimes it works, Colleen. I think the Leafs will play better Tuesday! So, how about those Maple Leafs? They sure are a frustrating bunch of fellas, that at least is for certain. At this point in the season, I think that it is fair to say that they are who we thought they were. Sometimes the breaks go their way, they score off the rush, the powerplay is clicking along, the goalies are standing on their heads. The problem is that when those three aspects of the game desert them, there is nothing left to fall back on. There is to me at least, just a shocking lack of sound fundamental hockey. The top two lines for the most part just do whatever the heck they want to in their own zone. The first line bails out to neutral ice constantly trying for the home run pass. Meanwhile, back in our zone we are chasing the puck, or worse standing around. I get that this isn't an overly talented club. Heck, yours truly has said for the last three years that they are mediocre. Somewhere in the 10th to 12th region in the East. Sometimes the team shows flashes of competent hockey, then it vanishes along the line of a Houdini escape trick. Our very best players, even though they aren't as gifted as others in the league, don't seem to be very interested in being difficult to play against. Fly byes, and stick checks aren't going to win you many close hockey games. Unless our vey best get tired of losing when it matters, I don't see much in the way of change happening here. It doesn't really matter who the coach is, in my opinion. I don't think Kessel, JVR, Bozak, Kadri, Gardiner, are the players that are going to do the little things that win hockey games. We have talked about them here for years, take a hit, deliver one now and again, block a shot, you know, the basic work hard kind of things that were screamed at us all through minor hockey. To be fair to the players, I also see a lot lacking from Carlyle, but certainly I don't see this as being all one sided. It is still my opinion that the game has passed him by. Changing coaches would be a nice start, because I don't have any faith that the team will make the hard choices and start a true rebuild. I cannot come to any other conclusion that the mediocrity will continue as long as this core of players is considered the leadership of the Maple Leafs. I guess the reality, Jim, is that other than the truly best teams, most clubs are like the Leafs: they have a few skilled guys, pretty good netminding and when they all work together, etc., they can look pretty good. The rest of the time, those teams struggle for consistency. I agree the Leafs don't show the work ethic needed to be a top team. They need to become difficult to play against. And they're not there yet. This team could drive a teetotaler to drink. It seems that every time that they reach a plateau of competence, sometimes approaching excellence, they manage to slip back into their old habits and fall flat on their collective faces. Either they do not have the talent, as Jim maintains, or the talent is there but it is being mismanaged. I believe that both factors are part of the equation but I tend to lean more to mismanagement: i.e. coaching. Colleen's second post struck a nerve. Lines and defense pairs are being juggled on a nightly basis and that lack of continuity leads to lack of cohesiveness which leads to inevitable mistakes. The constant changes are not a sign of creativity as much as an indication of panic. I can certainly understand a coach moving players to a different line or pairing if they are not meshing but not on a regular basis. The coaches picked the combinations in the first place and they should allow them the time to gain familiarity and function as a unit. As an example (and this is from David Johnson at MLHS) Gardiner to date has played 92.13 min. with Robidas, 62.42 with Polak, 59.47 with Rielly and 13.38 with Franson. No wonder he sometimes looks confused and hesitant. I cannot see much improvement ahead with Carlyle as coach. I agree with Jim that they need to break up the core. I have the feeling that Shanahan decided to give the present coach and players sufficient time to perform before making an evaluation. That time should be rapidly running out. Changes need to be made. The question of trading to break up the team's core is one that many organizations face, it seems, Pete Cam. "Can we win with this group" is the question Shanahan may be asking, while also having an eye ahead to when the team realistically could be in contention with the right kind of moves. I would say the Leafs are who we thought they were... to steal Dennis Green's now famous line from the NFL. A talented but inconsistent group that needs to be firing on most all cylinders to win the game. And I don't care what team you are, if you get a game with below average goaltending to go along with defensive gaffes, as happened in Buffalo, you will most likely lose that game to any other NHL team. You can argue that the Sabres are more an AHL+ team but the theory still applies. Are you thinking of Front Page Challenge perhaps Michael?? The long running CBC show with Pierre Burton and other panelists?? I think you're right, Pep. The Leafs are as you describe: a team that, when they are skating, working and making things happen (and getting great goaltending) will win their share of games. When they are off their game, in any area, they're just another team. I well remember Front Page Challenge- great Canadian show. But I think it was (as Colleen noted above) "To Tell the Truth" that is the show I was trying to remember! Those old shows were in black and white back then. Feeling old, Michael. Honestly, I was a child! The Leafs weren't ready for Buffalo and they should have been after holding them to an embarrassing 10 shots in their previous meeting. Of course Buffalo would want to erase that memory, just as the Leafs wanted to play better against Boston. The Leafs should have been prepared and ready, not surprised. The one line I wanted to change was the first. I liked Bozak better on the second line- I liked his game more- and the first line really needs someone like Winnick or Santorelli at least for 5 on 5 play. I think Kessel's first two goals this year were assisted by Santorelli. Clearly, Bernier had a good result against Boston prior to the Penguins game, and that seems to be the reason he got the subsequent start. Of course it makes the same sense as when Reimer got the next start after an amazing game/win against Chicago (when most expected Bernier in Arizona where we lost, too), so it was 'fair' and proved that Reimer was going to be rewarded for his stellar play v. Chicago (and that didn't seem to be the case at the outset last season). I have to say I was happy for him getting the chance to hold the net in that case. The only real difference for me was that Bernier didn't have to stand on his head to pull out the win v. Boston and he got the next start (after a day off) in the back-to-back against Pittsburgh. I think I would have explained to Jonathan that he had just taken out a premier team in the Bruins and had previously 'smoked' the Sabres, so we want to be sure of a win in a tough 3-in-4 schedule and have James take the Penguins in hopes that his previous successes against Pittsburgh might happen again. Treating it like a statistical observation rather than a slight (given that sharing back-to-back games seems to be the order of the day for our duo) should have been acceptable to Bernier (and, perhaps, motivated James to continue his success against the Pens). I don't think that Reimer did 'poorly' against the Sabres for mental reasons... it just seemed like he was off his game (and having no luck, not to mention a bad decision when he went swimming). A timely save might have broken the Sabres and a better start by the rest of the team would have helped. I actually thought it was possible to pull one out at 4-2, but we seemed to have no finish (despite multiple near misses) and that came back to bite us in the end. After the first Leaf goal, they weren't 'horrible' but I think very little 'bounced' their way after that 4th goal, but by then they had 'made their bed' and will benefit from a couple days 'off' to get set for the Preds as you noted, Michael. I think we will see some changes, but have no idea what trade possibilities may be in the mix... though part of me wants to 'wait and see' on a few guys, I think there is room for change/improvement without 'blowing it up'... sure would be nice to know the future and act in the now! It's funny- I know I'm saying this after the fact, but like you, I would have started Reimer against Pittsburgh and brought Bernier back on Saturday. Just a hunch, InTimeFor62! I think management wants to see the Leafs a bit more before making any major moves. 3. Trade a couple of excess assets and go get that hard charging point getting centre we have needed for four years. My guess is that trade time will see what happens unless of course something unexpected happens in the meantime (i.e., Leafs become way more consistent, or go off the rails for extended period). Tinkering with this core does not seem to be the answer, and as good as they can be, they are seldom consistently good enough to get them over the bubble. You've identified the challenge for management, Leafs Fan in Mexico. Do they build from what they have? Do they start over and build around players like Bernier and Rielly? Maybe so Michael, I really like Rielly a lot, maturing nicely. Also like Percy but too early to tell yet. Personally, I want to trade Riemer and Gardnier and take a chance on this group. I have always said, Leafs have a good second line and parts of a first. Kessel has a great shot but as he is showing both play and press, he is not a leader so lets not expect that of him and go out and get one (sure enuf aint Phaneuf). No problem, Marc- you can still be "Leafs Fan in Mexico"! That show was, as Colleen mentions, definitely To Tell The Truth. And it's up to us to figure out which Leafs team is the impostor. Is it the maladroit, sluggish, and confused looking group we saw at the start of the season, and again vs the Sabres, or is it the fast skating, back-checking group we saw in most of the games in between? It appears they're a combination of both - hence glass half-full O'Malley, yet again! Can we compete against the East's best? I don't think so. Based on our sample to date - and I agree that it's early - we're showing a little improvement in defensive responsibilities, in cycling in the offensive zone, and in our third and fourth lines. But, like the little girl with the curl, when we're bad, we're horrid! The team seemed out of sync in the Pens' game - passes were behind or ahead of the intended target, players didn't seem to be on the same page - and we all know the debacle the Sabres' game became. (It's cold comfort that we've lost 14 of the last 16 in Buffalo, so at least we played according to past history). The greatest concern to me is our lack of a second line - and that's the weakness that keeps us below the upper echelon in the East. Kadri hasn't shown chemistry with anyone, and his tendency to hang on to the puck rather than dish off to his wingers is a problem that isn't going away. Yes, his face-off work has improved, but his ill-considered forays into the O-zone lose as many pucks as he wins in the face-off circle. And even when he's with Kessel, it's Kessel who does the setting up. Anyhow, I don't think we're ready for prime time quite yet. We need an on-ice leader, a clicking second line, (I'd say Holland is more suitable for Lupul, based on the few games they played together), and maybe a reliable back-up defenceman. We're almost two months into the season, and if we want to truly contend before time runs out, I have a gut feeling we'll need to make a trade of some sort. Reminds me of another classic game show... Beat The Clock! The things you've described, Gerund O', are enough to keep the Leafs just outside the "being in serious contention" role. Leadership, consistent production from the second line, etc. I would suggest that "The Real Leafs are Standing Up"! !- Sometimes they stand on their skates (play well) and, sometimes they are standing Somewhere else - i.e. inconsistent and lacking multiple, variable ingredients in different games. Many of same issues are still appearing. Not to excuse anyone, especially management but it appears that the Leafs are like many of the teams I played for or coached. Very few of us have ever had the opportunity to be involved with a juggernaut. Occasionally, we may have been on a winning team but usually we were grouped with the Losers, some years less than others. We were provided with all the standard bromides but invariably application of all of these (back-check, work, grit, systems, etc. were not enough unless there was significant skill in the first place. in the NHL, there is only one winner out of 30 and most of us would think the top 8 would be a good immediate target. While there appears to be some improvement this year, the bottom line would suggest the Leafs are life and death for 16th and need a number of changes at all levels to make a significant step. The reality is this will be difficult with bad contracts, cap problems, limited prospect pool, and questionable management not withstanding the questionable makeup of the management, coaching and players. Michael, with your background in communications and your other learned VLM followers, I would like to hear opinions on the current Media - Kessell issue. - What responsibility does a player have to the Media? - Should access to players be limited? - Should only certain spokesman be able to speak for Leafs? - Is Toronto media really a problem with signing free agents or losing good players to free agency? I believe this justifies a new topic and I will definitely respond. Let me think on your questions, Ralph (RLMcC) and post on that subject in future. Hi RLMcC. I think the Toronto media is ridiculous. I don't have a problem with a player who feels they just can't deal with the media minutes after an embarrassing loss. The media hasn't treated Kessel kindly, even as a 21 year old. His refusal was milder than it could have been. I think Siegel took this way too personally though he's one of the better hockey writers IMO. Many reporters are incapable of understanding what a player feels after a very unfortunate game, but I'm really surprised to see this from Jonas. A certain amount of trust should be part of the player/reporter relationship---not in Toronto. The Toronto media often uses the word "entitlement" quite a lot but never see it in themselves. I think players should have some choice about when they are available. players and I am talking about the so called leaders? - Controls the press (certain people) and that with full intention our view on this guys? I am talking about the Kessel article at start of training camp and how the press reacted (not only but that fired the Initial thought) and how Phaneuf is viewed by some guys( lots of other examples but these are the best). with this team the 20 game mark has no meaning. After thursday you wont know more than today. And last year after 60 games we talked home ice. No, we are not strong enough up the middle. I have no issues with the bottom half of the team center wise, Holland, Santorelli, Carrick and Smith are good options and Komarov and Winnik can step in. But our top two centers are by far not good enough. Yes we all like Bozak and everybody , especially the analytics crowd, loves Kadri but let's face it there are not a lot of teams in the east that are so weak on the top two lines at center. Try and match them up against Zetterberg and Datzyuk, Bergeron + Krejci, Stamkos, Tavares, the Staals, Crosby and Malkin and so on. They are not good enough and with these two they won't get significantly better. We are not getting what we need from our second line. Kadri and Lupul are not clicking. Lupul is now injured and Clarkson doesn't fit at all. Who is our 2nd line? Whatever Carlyle tried it isn't working. I would put Lupul on the first when he is back and try JVR with Kadri but he is not good now either. I don't know if the 3rd and 4th line will be effective over 82 games but I don't worry much about it. They can be. Our D is by far not good enough. Along with the middle this is the achillis heel of this team. They are not only not good enough against really good teamsthe are not good enough by any Standards. The only one who is a 1-3 D man is Dion and he is not good this season,and the rest are from number 4 on down. Rielly will be the go to guy in the future but he is twenty. What has my gut to do with it? The team is by far not good enough to be named with the better teams in th east. I am suprised because of that question. I wouldn't be suprised if they miss the Playoffs again. Are they good enough to compete with the bubble teams? Or better: Are they good enough to compete (not win, compete) with the worst team in the league? I don't think that the question with leadership to compete is a good question. To compete, every player has to prepare himself individually and has to be ready for the game and give it his all. That's up to the players, not to the coach and I hope they don't need a leader who tells them every game they have to compete, that would be a catastrophe! They have to know, they are NHL players. There are question marks with our leadership for sure, but the compete level should not depend on leadership. I do not see the will to win. I do not see it in the players I want to see it from. Hi Marcus- I agree on the question of "compete". That should not require veterans or "leaders" to rally the troops every night. That will to compete largely has to come from within, though on certain teams that have great pride, there is an expectation that every player will do their part. There is an internal pressure. There is a role for leadership, of course. And this team is desperately lacking in this area. however we turn it, the Leafs are in a very bad situation. Yes, I think they can make the playoffs and yes, I think if everybody gives his best they can maintain their strong play from yesterdays game. But, they have the issues I mentioned before. Weekness up the middle and on defense. Six players are on long term contracts of 4 years or more, all these contracts have some kind of NTC's. Most of these contracts are at least problematic, if not impossible to move. If the cap will not rise significantly the Leafs have 15 million of cap space for next season. The contracts of Kadri, Bernier and Franson expire. All three will fight for a big raise. Needing the 15 millions for these three contracts is realistic. That would mean we have 17 players under contract with no cap room to renew the contracts of Winnik, Santorelli and so on and we have no room for improvement. In this scenario and that's the way it is, we can not even create a roster of 21 to 23 players. We are stuck with this roster for years and we do not have enough emerging players to make this team much better. Not enough to make a diffrence. Trading one of these contracts will be extremely difficult because of a lot of other teams have cap issues themselves. Robidas with an over 35 contract over 3 years and and the goalie situation are not helping either. Who will be the number one? And will there be a reasonable situation to trade the other guy? Coaching changes won't help enough. Can Shanahan clean this mess? How much time will he have to do so?